If the WordPress Gutenberg Project claims to change everything, the question is: What it changes for the different groups of WordPress users? Here, we have tried to calculate the magnitude of impact, and what it will mean to different users associated with WordPress. The first and foremost effect of the WordPress Gutenberg project will be in the form of a changed WordPress publishing experience. The TinyMCE WordPress editor will be replaced by the new WordPress Gutenberg editor. The WordPress Gutenberg editor changes the way content is created and published through WordPress. It lets you create content through block-based editing system. Here’s a complete illustration on what WordPress Gutenberg editor is and what makes it so different from the TinyMCE WordPress editor. We will first take a brief look at what changes are to be expected and then we will analyze what the change/s mean for you, as a WordPress user. Impact of WordPress Gutenberg project on your existing WordPress websites? What does WordPress Gutenberg mean for commercial theme and plugin developers? WordPress 5.0 with the Gutenberg editor is about to make a historic change, it is about to completely redefine how content is created and published with WordPress. However, not everyone in the WordPress community seems to be happy with this historic change. The WordPress users have mixed reviews about this new editor. While a part of the community is ready to welcome the new editor, for some WordPress users, the change is hard and unnecessary. TinyMCE has been there since the launch of WordPress in 2003. All the WordPress users are comfortable with the simple and intuitive options it offers to create pages and posts (including my own team). And it seems difficult to change our habits and adjust with the Gutenberg editor. But we have tried the WordPress Gutenberg editor, and it wasn’t a bad experience. It has some really good features that allow you to create content more efficiently. WordPress is a user-friendly CMS and has established its reputation as a blogging platform for non-tech-savvy people. Even though it can be efficiently used to create any kind of websites like eCommerce, online directories, or business websites, WordPress is mostly used to create content based websites. The WordPress Gutenberg project is crafted with the aim to revamp the whole publishing experience through WordPress. It comes with the block-based editing system. This block-based system makes it easier to change the structure of your pages/post very easily. Besides, there are other features too that make it very easy to create and publish content with WordPress. 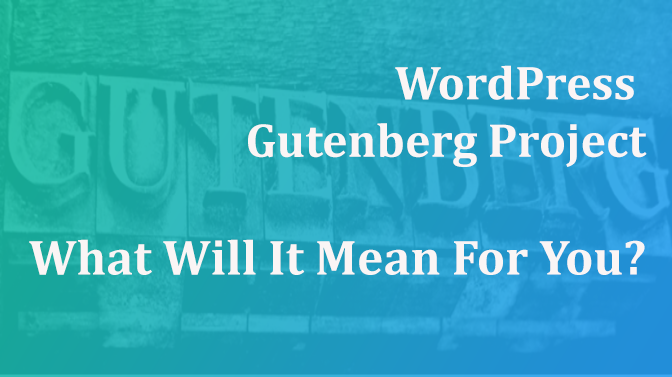 However, one of the most common question regarding the WordPress Gutenberg project is: What will be the impact of it? It is already on its way and we can’t stop wondering what it means for the different groups of people associated with WordPress in anyways. Is it good, bad, or best? Will it make things easier or difficult? Will you need to change a thing or two about your WordPress site? How much time will it take to get used to with the new editor? The questions are many, and they have different answers for the different level of users. Nowadays, users like multi-media rich content with images, graphics and different forms of text (quotes, tables, link, etc.). 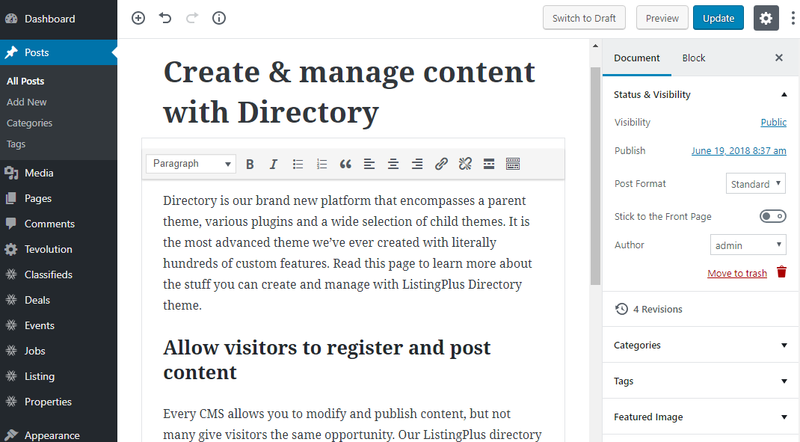 The classic WordPress editor lets you create multi-media rich, intuitive content but the WordPress Gutenberg editor really lets you create the same thing more efficiently. How will Gutenberg impact your live WordPress website? As per a Wikipedia survey, WordPress powers 58.7% of all the websites whose CMS platform is known. So with the big change in the WordPress system, what will happen to all those websites? If you too own a WordPress website, you must be wondering what will be the effect of Gutenberg for your WordPress website? One of the most common questions in the WordPress user’s mind is “Will WordPress Gutenberg cause compatibility issues with your existing themes and plugins?”. The answer is simple: With the WordPress 5.0, only the editor changes & nothing else. You won’t need to change your theme or buy a new one. No other enhancements are required for this new WordPress editor. What will happen to your existing posts/pages? The new WordPress Gutenberg editor is neither a page builder, nor a front-end editor. It is just a new way to create content with WordPress. With only the editor hanging, nothing else will change. Your site data, previous pages, and posts will remain intact. Even the pages not built with the Gutenberg editor will appear perfectly. This is a post written using the classic editor appears with the WordPress Gutenberg editor. There is a dedicated block named the “Classic editor” in the WordPress Gutenberg editor. This block, as the name suggests, shows the posts and pages in the TinyMCE classic WordPress editor. You can even use this block to create an entire post using the WordPress classic editor. However, once you get familiar to the Gutenberg editor, you would definitely love to explore its options, rather than sticking with the old editor. So you can easily update it. The transition of a post created in the classic editor to the Gutenberg editor will be lossless and easy. So even when you update to the new WordPress 5.0 CMS, your posts and content will remain intact. To create new posts, you will have to use the Gutenberg editor. There are a few advanced Gutenberg features, that require the support from the theme. But with WordPress 5.0 these features will come turned off by default. If your WordPress theme wants to use these features, it can use them by activating them. Therefore, WordPress 5.0 won’t break your theme, or plugins, if that’s what you are scared of. However, that’s about the basic 5.0 version. This version only changes the editor, however, the later versions can bring about more changes that would require some changes from your side too. It looks like WordPress Gutenberg may not just be limited to the editor only. With newer versions, the WordPress Gutenberg projet intends to change the whole publishing experience. There may be changes in the core of WordPress that would require theme updates to ensure compatibility. But if you are using a premium WordPress theme, then there’s nothing to worry about. Almost all the reputed theme providers are already researching about the new WordPress update and preparing for its impact. The theme providers, like they always do, will provide you with a theme update to solve the compatibility issues. However, we think it’s too early to predict the changes it might bring to the core WordPress. For now, the only thing we have to be prepared of is the Gutenberg WordPress editor. And it will integrate into any theme/plugin without any issues. So the WordPress website owners have nothing to be afraid of. WordPress 5.0 will definitely change things for them, but not for worse. With the speculation of WordPress Gutenberg to arrive in the latter half of 2018, it’s time for it to arrive soon. However, the new version of WordPress, i.e. WordPress 5.0 will only come with a new editor. This new editor will work well with most themes and plugins. Whether you are a new WordPress user or an existing one. The Gutenberg editor does provide a more efficient way of creating content. With the Gutenberg editor, you can create content, reuse blocks, restructure it more easily than ever. So if you are confused because of the mixed reviews on the WordPress Gutenberg Project, you should proceed without any doubts. We must keep in mind that all the major changes in any software only intend to bring about a positive change. Hence we would like to look at this new Gutenberg editor as a catalyst for positive changes in WordPress. If you haven’t tried the WordPress Gutenberg editor yet, you should probably try it. Install the plugin at a test site and you will see that the block-based editing interface is actually user-friendly. Moreover, you can choose from this list of the best WordPress Gutenberg themes to start now with your new website. The new WordPress Gutenberg project is about to change many things about different content areas of a WordPress website. Even though the first version won’t need a lot of work to accommodate the system changes, we cannot be sure about the future versions. This change in WordPress can really impact your business if you are service based company that creates or maintains WordPress websites. If you run a web design agency and/or maintain WordPress websites for your clients, then the WordPress Gutenberg project can affect you. Because even though the latest version is least expected to cause compatibility issues, the advanced version of WordPress Gutenberg may need some adjustments. If you are a WordPress maintenance service provider than after the release of WordPress Gutenberg, you need to check and ensure that your themes work well with the new WordPress Gutenberg plugin. A new major WordPress update sure does mean some work for you. It will be typically difficult for you if you are a service based WordPress company that builds and maintains WordPress websites for clients. You will have to update their website, check if anything is broken and fix it. However, WordPress 5.0 only comes with a new editor. And before it officially replaces the TinyMCE editor, you can download it from the WordPress plugin repository and check how it will work on your client’s website. You can also inform and educate your clients about the new system. Web design agencies based on WordPress will have to prepare to make sure that their clients’ websites run flawlessly with the new updates after WordPress Gutenberg is released. Generally, every WordPress update changes something or the other. And the updates for the themes and plugins are sometimes the fixes to accommodate these changes. We cannot say with certainty, what content areas other than pages and post will the future rollouts of the Gutenberg project effect. It will definitely change many things since it claims to revamp the WordPress publishing experience. So the only option with the theme & plugin developers is to update their themes/plugins so that they work flawlessly with this new Gutenberg plugin. This is something that you always do when a new version of WordPress is released. However, with WordPress 5.0, there are lesser chances of compatibility issues. It only changes the editor and is likely to go well with almost all the themes and plugins. So there’s no need to be afraid of this change. There will be enough time for you to understand Gutenberg and before it impacts the core components. The new WordPress Gutenberg editor surely has different implications for the different level of users. And for some of them, it looks like a work to accommodate the changes. However, WordPress is a CMS that is used by a majority of non-technical users to create their website. Because with the easy options WordPress provides it is so easy to manage and maintain their own website. And with a major change coming up in this user-friendly CMS, everyone is a bit skeptic. But we have to understand that even though we love our classic WordPress editor, this new Gutenberg editor intends to make things easier.